An apartment in Boden is transforming into a public living room. A space where dining, fika and conversations become art. This project places the terms and conditions for asylum seeking immigrants in the spotlight. Bild: 1 av 3 Foto: Joanna ZawiejaKonstverket Al Madhafah/ The Living Room – ett verk av arkitekten Sandi Hilal i samarbete med Yasmeen Mahmoud och Ibrahim Muhammad Haj Abdullah. Bild: 1 av 3. Foto: Joanna ZawiejaKonstverket Al Madhafah/ The Living Room – ett verk av arkitekten Sandi Hilal i samarbete med Yasmeen Mahmoud och Ibrahim Muhammad Haj Abdullah. Boden has changed radically as a city the last decades. For a long period of time, Boden served as a military town, with the largest garrison in the nation, and with foreign visitors having to inquire authorization to visit the city. Today, the military presence has declined, permissions are not required anymore and the Swedish Migration Agency has based its northerly office here. This context is where artist and architect Sandi Hilal has conceived the work Al Madhafah/The Living Room. Springing from the historic past of Boden, Sandi Hilal has explored the circumstances of life in exile; asking on whose terms is integration materialized in society. With references to that consideration, she is investigating the symbolic and actual value of the living room as space. The living room has the potential of what hosting entails: the act of inviting, and accommodate on specific conditions. Are gatherings in our living room the source from where our societies change? The idea of transforming an apartment into a public living room came to Sandi Hilal during a period of research, when she met Ibrahim Muhammad Haj Abdullah and Yasmeen Mahmoud. They are currently living in Boden, after escaping their home in Syria, and are opening up their house, and faithfully inviting guests in – a gesture that requires a living room. They drew on the tradition of hospitality, never accepting that they should give up their right to be hosts in their new home. They continued what was an important part of their life in Syria, opening up their living room to host both Swedes and others. The living room, when opening itself to host the stranger guest, functions as a self-representational space, that has the potential to subvert the role of guest and host and give a different socio-political meaning to the act of hospitality. The possibility of hosting had become, for them, a way to regain access to their lost personal and collective history, combining their lost life in Syria with their new life in Sweden. By exercising their right of hosting and activating their living room, Yasmeen and Ibrahim no longer felt themselves to be statistics, passive guests in Sweden but to be owners of their own story. This space was something that Sandi Hilal found was missing for many newly arrived refugees. The asylum accommodation in Boden is called ”Gula huset” (the Yellow House) and is located on Prästholmen, appearing as a yellow cube in the open landscape that surrounds it. In the 1960’s, several identical buildings existed in the area but have been torn down during the years. It is in Gula huset that one of the apartments will be transformed into a room for collective activities, the so called Al Madhafah/The Living Room. The programme of activities that will be held here, whereas they will act as an open preschool or casual meeting for brunch, will actuate a hospitality that previously was non-existent. On September 1st 2018 Al Madhafah/The Living Room will be opened for the public. The project is a collaboration between Havremagasinet, Bodenbo, Bodens försvarsmuseum and the Public Art Agency Sweden. The Al Madhafah/The Living Room is also a part of the exhibition Public Luxury that takes place on ArkDes in Stockholm until January 13th 2019. 2016-2018 Public Art Agency Sweden will focus on public art in late modernist dwelling area, built 1965-1974. A part of the government’s Taking place-project. 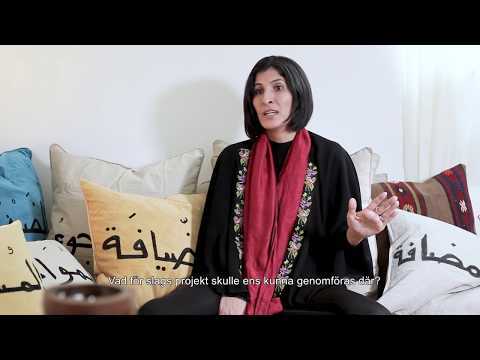 Al Madhafah/The Living Room, a short film about the first phase of the project directed by Ana Naomi de Sousa, was commissioned by ArkDes, Stockholm, with the support of Public Art Agency Sweden.